When it comes to deluxe restaurants, Chicago’s Gold Coast has grand selections for Walton Residence visitors. Enjoy French cuisines and delectable Asian delights all around our gracious neighborhood. Here are some of the best restaurants to check out during your luxurious extended stay in the Gold Coast. From the outside it may appear as if you’re stepping into an old warehouse, but the inside is truly magical. 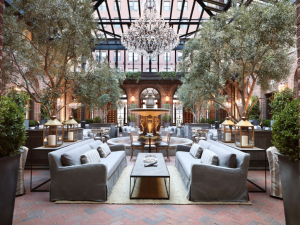 The Grand Courtyard is beautifully lit by glass ceilings during the day and a crystal chandelier at night. The 3 Arts Club Cafe features Mediterranean inspired dishes and is open for breakfast, lunch, or early dinner. Le Colonial is a Vietnamese restaurant that brings part of Asia’s French Colonial charm to Chicago’s Gold Coast. Decorated with indoor palm trees and a second floor balcony overlooking Rush Street, visitors will feel as if they have been transported to 1920’s Vietnam. The menu consists of traditional Vietnamese dishes such as grilled chicken mango and shrimp-wrapped sugar canes. 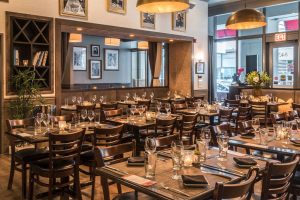 Bistronomic is an elegant restaurant located just a few blocks from the Walton Residence. It specializes in modern dishes with French cuisine influences. Garnering rave reviews from publications such as Chicago Magazine and Eater, reservations are highly recommended for this Gold Coast hotspot. 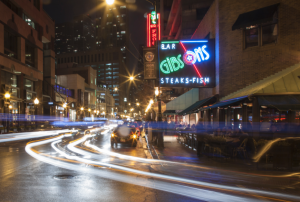 One of the most popular bar and grills in town, Gibson’s is famous for their steaks. Since opening in 1989, Gibson’s was the first American steakhouse to be awarded a USDA Prime Beef Certification. The atmosphere is casual, though gentlemen are not permitted to enter wearing short sleeve shirts without a jacket. 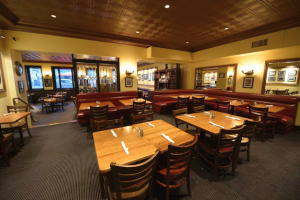 Voted one of the top five restaurants in the Gold Coast, 3rd Coast Cafe has been serving Chicago for over thirty years. Their art gallery showcases pieces from some of the newest and most brilliant artists. 3rd Coast Cafe’s meals are all prepared with fresh ingredients and the menu includes vegetarian options, select wines, and craft beers.